Dork Diaries fans! 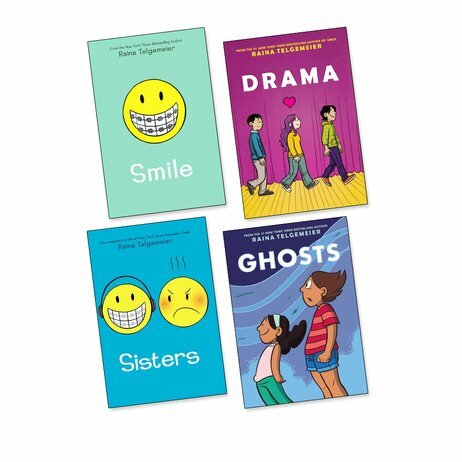 There’s a new queen of cartoon funnies: Raina Telgemeier. A total must for comics fans. All her pictures are in colour. All her stories are hilarious. And she’s won enough awards to make you stop and look twice. She’s written four books so far. Now lucky old you can grab all of them. Quick, hurry: you want to be in the lead, right? Sibling bothers. Bezzie bust-ups. Groanworthy accidents. All the familiar cringes of teen life. Find yourself (and all your mates) inside.